Syria's air defenses shot down missiles targeting Shayrat air base in Homs province early Tuesday, state media reported, as a Hezbollah media arm said missiles targeting Dumayr base near Damascus were also intercepted. Iranian news agencies also reported missiles being fired toward Shayrat. Approximately nine missiles reportedly targeted the base; their source isn't yet clear. A Hezbollah milita media unit shortly afterward stated that Syrian air defenses intercepted three missiles that targeted the Dumayr airport in northeast Damascus. Reports of that attack had been swirling on social media before the announcement. 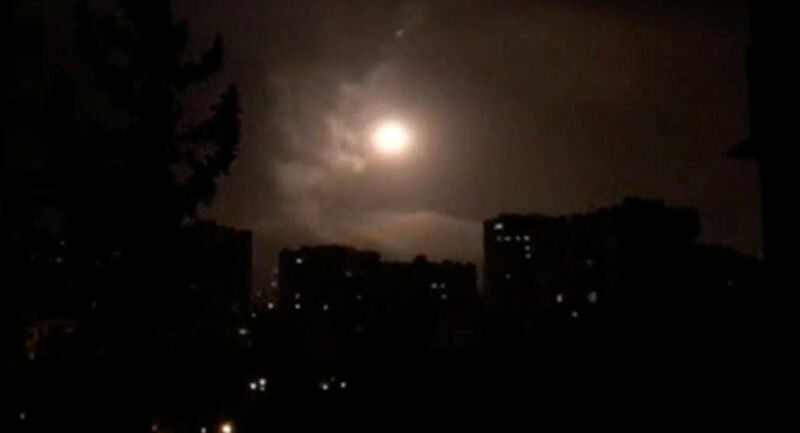 ​Syrian news agency SANA stated that "Syrian air defense shot down missiles which violated airspace over Homs." The agency did not indicate the source of the strike, but later said no casualties or material damage had been reported as a result of it. Social media reports are pointing the finger at Israel for the strikes. "There is no US military activity in that area at this time," Eric Pahond, a Pentagon spokesman said when asked about the strike in Homs. "We do not have additional details to provide." According to the reporter, missiles crossed into Syria through Lebanon. This incident follows the April 13 strike the US, UK and France carried out in Syria as a response to the alleged chemical attack in Douma, which both Russia and Syria have repeatedly stated never happened. The operation, which was carried out in less than 60 minutes, targeted three main chemical weapons-related sites and one command center.